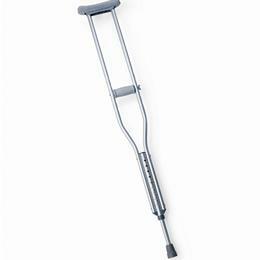 Medline Push Button Crutches: Double Extruded Center Tube Provides Load-Bearing Strength Where It'S Needed The Most While Special Footpiece Utilizes Durable Rivets To Secure The Aluminum Tubing From The Inside, Providing More Stability Than Plastic Connectors. Patented I-Beam Center Post Limits Footpiece Rotation To A 1.4 Turn, Always Keeping The Push-Button In View And Facilitating Easy Adjustment. Long, Virtually Unbreakable Stair Deflector Helps Protect Against The Crutch Slipping On Stairs And Helps Increase Stress Tolerance At All Angles Without Cracking; Non-Skid Rubber Tips Provide Good Traction. Built-In Metal Ring Helps Prevent Excessive Wear And Ensures Maximum Durability. Crutches Come Packaged Completely Accessorized With No Assembly Required. 300 Lb Weight Capacity. Youth, 4'6"-5'2", Latex Free.